“Every year, graduates of colleges and universities across the United States are making a difference in communities overseas through Peace Corps service,” says Acting Peace Corps Director Carrie Hessler-Radelet (Peace Corps volunteer, Western Samoa, 1981-83), who visited Notre Dame in 2011. Peace Corps volunteer Lisa Floran, of Valparaiso, Ind., graduated from Notre Dame’s Program of Liberal Studies in 2009. As a health volunteer in Senegal since 2011, she has helped develop a life skills curriculum that has reached more than 5,000 young people across the country and is being replicated by other organizations. She says her experience at Notre Dame prepared her well for international service. Peace Corps recruiter Rok Teasley, a returned volunteer who served in Moldova, advises and interviews Notre Dame candidates and can be reached at rteasley@peacecorps.gov. He is working with the Center for Social Concerns to plan a special panel presentation and volunteer Skype event in March. 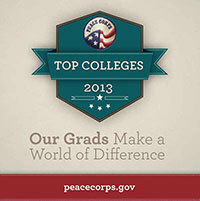 Graduating college students are encouraged to apply by February 28 for remaining assignment openings for 2013, and the chance to be considered for programs in early 2014. Peace Corps volunteers must be U.S. citizens and at least 18 years of age. Peace Corps service is a 27-month commitment, and the agency’s mission is to promote world peace and friendship and a better understanding between Americans and people of other countries. Read about the work and experiences of currently serving Midwestern volunteers at midwestpcvs.wordpress.com. Peace Corps service makes a difference not only to the communities served, but also to the volunteers themselves, who return home as global citizens with cross-cultural, leadership, language, teaching and community development skills that position them for advanced education and professional opportunities in today’s global job market. Ninety percent of volunteer positions require a bachelor’s degree. Volunteers receive paid living expenses and full health and dental coverage while overseas, and upon completing their 27-month service they are eligible for graduate school programs and federal hiring benefits. Approximately 121 Indiana residents are currently serving in the Peace Corps. Overall, 3,121 Indiana residents have served since the agency was created by President John F. Kennedy by executive order on March 1, 1961, with more than 210,000 Americans serving in 139 host countries. Today, 8,073 volunteers are working with local communities in 76 host countries in agriculture, community economic development, education, environment, health and youth in development.